Quickly moving in the direction of an all-in-one marketing suite, SEMrush now counts more than 25 multifunctional tools designed for marketing professionals. With this variety, sometimes it may be challenging to find the right tool that will help you achieve your specific goals. For your convenience, we’ve changed the SEMrush navigation system to be more user-oriented, and we’re excited to present you with our first insights! Eager to find out what the new navigation will offer? In return, SEMrush will present you with the most complete toolkit designed to help you solve your problems based on your area of specialization. Interested in several specializations? You can switch to another toolkit in one click — just use the left menu. 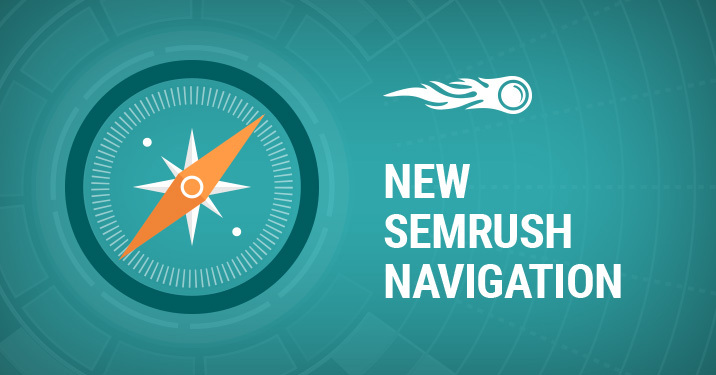 Find out more details on SEMrush’s new navigation here. We hope that the new navigation system will improve your SEMrush experience and help you find more useful tools and handy features suited for your needs. More updates are on the way, so stay tuned and share your feedback with us at [email protected]!